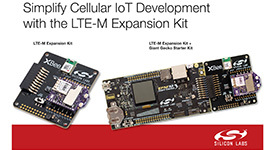 Silicon Labs' LTE-M expansion kit, jointly developed with Digi International, accelerates low-power cellular IoT applications. Silicon Labs' Wireless Xpress helps developers get IoT applications connected and running in a day, with no software development necessary. The industry's broadest timing portfolio for 56G/112G SerDes clocking applications. New wireless software from Silicon Labs enables Bluetooth Low Energy communications with sub-GHz IoT devices through easy-to-use mobile apps. Z-Wave is a leading mesh networking technology for the smart home. The Si3406x PoE Powered Device ICs deliver best-in-class integration and efficiency for IoT applications. Silicon Labs' new low-power Wi-Fi devices optimized for battery-operated IoT end nodes slash power consumption in half. Silicon Labs' Si54x Ultra Series crystal oscillators provide best-in-class jitter performance, frequency flexibility and programmability for 100/200/400G applications. Silicon Labs' new Si117x biometric sensor modules add ECG measurement for advanced heart rate monitoring in wearables. Silicon Labs' flexible portfolio of car radio receivers, tuners and coprocessors address all automotive market segments and digital radio standards. Silicon Labs' new EFM32 Giant Gecko microcontrollers offer the most advanced feature set and largest memory footprint in the low-power MCU market. Silicon Labs' high-performance Si54x crystal oscillators offer the industry’s lowest jitter frequency-flexible solution for a wide range of networking and communications applications. Silicon Labs' new CP2615 audio bridge chip simplifies digital audio design without the complexities of firmware development. The Bluetooth solution for Apple HomeKit helps developers speed time to market. The Silicon Labs BGM12x SiP module enables the industry's smallest Bluetooth module footprint. Silicon Labs' MGM111 mesh networking module simplifies Thread and ZigBee connectivity. Silicon Labs' Simplicity Studio development platform provides faster, easier software tools for the IoT. The Si828x ISOdriver family offers ultimate protection for inverters and motor drives. Silicon Labs' Si838x PLC field input isolators offer superior solution for programmable logic controllers.